Thank you all so much for being here tonight. Since there's been some debate about me in the news, I'm going to start off on a personal level, so you can understand more about who I am and my perspective in life and how that carries over into my approach to governing this City that I love so much. As some of you may know, I lost my dad to cancer just about one year ago on March 31st. Losing my dad got me thinking that I need to focus much more on family and being healthier. I'm trying to build exercise more into my weekly schedule. I'm trying to cook more for my family and eat right - very proud that somehow I got my teenage sons loving Brussels sprouts with this easy recipe that my sister-in-law introduced to me. I recognize that striving to be healthy is a journey; it is a process; it is something that we all have to keep working towards as we put our goals into action. Being healthy ensures that we can not only survive but thrive in our lives. At City Hall, I'm trying to help our employees to be healthier. We started a wellness personal coaching program so that employees can set their own goals and have someone there to guide and encourage them as they work towards reaching those healthy goals. On a larger scale, I'm constantly thinking about how I can make sure that together we ensure that Hoboken is healthy for the long term. No offense Hoboken, but we were pretty sick there for a while. Financially, if the hospital had gone bankrupt, we would have been on life support. Thankfully over the last four years we've taken our medicine. We've been putting our financial house in order with honest, gimmick-free budgets, cost cutting measures, and responsible surplus levels. Instead of a junk bond status, we're now a healthy AA+ according to Standard & Poor's which came in and did a full evaluation of our City last fall. Hoboken is healthy and it shows. We've reduced our taxes by 12 percent over the last four years. Today, our strong real estate market post-Sandy is a testament to the fact that Hoboken is a vibrant, exciting City where people want to live and work with tremendous opportunities for the future. 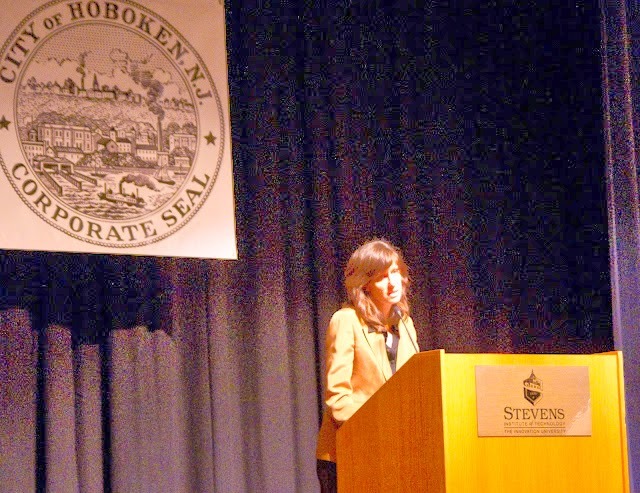 But together we have to make sure that Hoboken's health runs deep to our City's core. Now that we've built this financial foundation, we have to keep moving ahead to make sure that our City is stronger than ever for the future. We cannot rest on our laurels, but instead we must focus ourselves on creating a healthy Hoboken infrastructure that can withstand the increasing challenges of the future. We are a great City with a rich history. When it comes to our water main system we've got a rich history, too, but I don't think that is something we want to preserve. In fact, we still have some iron pipes that were installed in the Civil War era. I think we can all agree that we'd prefer to replace our very old pipes as quickly as possible so we can avoid disastrous water main breaks. I want to thank United Water for working with us to create a preliminary water main master plan that estimates the cost to upgrading our system at about $50 million. This year our focus will be on negotiating an agreement that ensures our water revenues, as the result of the growth of our City now and in the future, are used for the necessary upgrades to bring our water main infrastructure into the 21st century. I recognize that Hoboken's health depends on this, and my Administration will not stop until we have a fair agreement that ensures an upgraded water main system that can reliably provide this essential service to Hoboken residents. Flooding is also an important issue for our City. Flash floods have become more and more severe each year and the Sandy storm surge showed just how vulnerable our City is to climate change. Our residents and businesses cannot afford another Sandy on top of all the flash flooding we face every year. I am proud that in partnership with an international team of experts led by OMA, a Dutch firm headquartered in Rotterdam, we have developed a great proposal that could be a model for urban resiliency and help protect Hoboken and parts of Weehawken and Jersey City. With everyone's support we can accomplish what was considered the impossible: protecting our great City fully from all types of flooding! The plan would protect our entire city by implementing a comprehensive urban water management strategy. Along with protecting all of our residents and businesses, it would protect the PATH station, our electrical substations, our hospital, the North Hudson Sewerage Authority, and our fire stations. Through a federal design competition with billions of dollars in funding available, we have a tremendous opportunity to actually fund a large part of this strategy. Our urban is one of ten finalists, and we feel like we are strongly positioned, with tremendous support from our community, to be one of the winners and make this idea a reality. While the design competition is an excellent opportunity, we are already working to implement components of this plan as quickly as possible to protect our City from flooding. In partnership with North Hudson Sewerage Authority, we are moving forward with a second flood pump at 11th Street that will address flooding in western Hoboken, including the area around the ShopRite. A major reason why our streets flood is because we have a combined sanitary and stormwater sewer system that is overwhelmed during heavy rains at high tide. So we are also working with North Hudson Sewerage Authority on a plan to separate the sewer system in the 30 acre North End Rehabilitation Area. We are continuing negotiations to acquire the 6 acre property in Northwest Hoboken owned by BASF. The site could serve not just as a park for the neighborhood, but also as an underground parking garage that can double as stormwater detention space in the case of severe storms. In addition to highlighting our vulnerability to flooding, Superstorm Sandy also showed us the need for a more resilient energy system. Most critically, we need emergency backup generators so our police and fire, OEM and volunteer ambulance corps can keep operating throughout a storm, and I thank the City Council for their unanimous support for a bond to make sure that happens. After Sandy, I remember walking through senior buildings without even hallway lights, and we all remember how hard it was just to access basic services. We can't let this happen again. So on a larger scale, we are engaged in a unique partnership with Sandia National Labs, the U.S. Department of Energy, Board of Public Utilities, and PSE&G to design and build a 10 megawatt micro grid, which would be one of the largest in the country. In addition to our first responders, it would protect our most vulnerable residents including seniors, the disabled and our Housing Authority population. And it would ensure that basic community needs are met by connecting to supermarkets, pharmacies and gas stations. In order to build this micro grid, we will apply for grants to offset costs and bid out the project so that it is built and maintained by the private sector through a public-private partnership. For the health of our City, we also need to focus on our transportation infrastructure. Our streets are a mess after a very tough winter and we're busy filling those potholes, but some roads are so bad that they need to be repaved. We only receive a small amount of funds each year from the state to repave our streets - enough to pave a few blocks. This year we will be introducing a bond to supplement that funding so we can pave more of our roads. It will also include funds to make our dozen most dangerous intersections safer for pedestrians and drivers. We're continuing the public process to redesign Washington Street, and if our plans are approved by the state, we'll be repaving Observer Highway and turning it into a street that's safer for all users. We've hired a planner to work with the community to create a parking and transportation master plan that will include a review of all our parking policies. And we're working to expand and improve transportation alternatives. The Hop will be relaunched with two new buses that are arriving in April. We know there's been some frustration with the Hop's reliability, but we are finally getting those new buses and want people to give it another chance. This summer, we will be launching a regional bike share system with Jersey City and Weehawken at no cost to taxpayers. With 800 bikes, it will be the largest next-generation bike share system in the country and will provide another healthy transportation alternative to get people around town, to the PATH or ferries, or to visit our neighbors in Jersey City and Weehawken. I am proposing to issue new taxi licenses for handicap accessible taxis so that we can improve transportation options for seniors, the disabled, and our entire community. And we have been working with NJ Transit on the redesign of Hoboken Terminal which would improve transit access for everyone. Very soon we will be introducing a final revised NJ Transit Redevelopment Plan for consideration by the City Council. Another kind of infrastructure we need is jobs infrastructure. Businesses want to be located in Hoboken because of our skilled workforce, quality of life, and access to mass transit. That's why Thomson Reuters recently announced that they will relocate 450 jobs to Hoboken. In redevelopment areas, we need the kind of mixed commercial development that attracts and creates jobs and that lessens the impact on our infrastructure. And I am working to bring accelerator space to support and build small businesses in Hoboken. Tomorrow, we will be introducing a budget that reflects the work of the last four years and our priorities for the future. It is a fiscally disciplined, honest budget that stabilizes taxes with a less than 2% increase and a responsible surplus while making a down payment on repaving our worst roads and making our most dangerous intersections safer for pedestrians. In creating this budget, we face significant challenges. In the past year, due to newly negotiated agreements, labor costs alone increased by $1.3 million. Healthcare costs have gone up by 7 percent. We are still paying legacy costs like an $800,000 judgment against the City for an illegal retirement plan under a former administration. And we must invest in legal representation so we can protect our community and fight for our waterfront. I thank all of our directors who worked hard to find savings in each department to offset these rising costs so we can hold the line on taxes. At the end of the day, we have a gimmick-free budget that is as tight as we could make it while covering our current costs, maintaining a responsible surplus, and still moving forward with important projects. This is the kind of fiscally responsible budgeting that resulted in our bond rating being dramatically upgraded and will ensure that we can make the investments in our future that our City needs. At the same time, we will continue to make improvements to the public safety and quality of life for our residents. Crime in Hoboken is at an all-time low, but we are always working to do more. We completed renovations at Police Headquarters and brought on extra Class II officers to boost our police presence on weekends in a fiscally responsible way. Chief Falco will be retiring in a few months, and I want to thank him for his years of service. We're also focused on sanitation strategies to keep our streets cleaner. More than 150 solar-powered compacting trash and recycling bins were installed at our highest traffic areas along the waterfront, PATH area and Washington Street. They're enclosed which should stop trash from overflowing onto our sidewalks, and they have five times the capacity of normal bins and send a text message when they need to be emptied so we can work more efficiently. Hoboken has more open space and recreation options than ever before. We've opened 1600 Park, rebuilt Sinatra Field, acquired land for a Southwest Park, and are in negotiations on a plan to create a park at the Pino property at 7th and Jackson. In a few months, we will have new recreation and open space under the 14th Street Viaduct, and I thank Hudson County Executive DeGise and the freeholders for their work on this project. All of this field space means that we were able to expand recreation options and for the first time offer baseball to 4 year olds. The demand has been overwhelming with over 300 kids signed up. We're also glad to offer for the first time this year new lacrosse and swimming recreation programs. I also want to thank library director Lina Podles and the board members who are here. The library is such an important resource to our community with growing demand for services, and this year they will be open an extra nine days more than last year. They will also start a Makerspace laboratory with computerized tools and training for creating prototype projects. I know my sons will love that. Finally, for our seniors, we've rebuilt and upgraded our Multi Service Center with ADA accessibility, more comfortable furniture, and electronic BINGO. And all of our new shuttle buses will also have wheelchair lifts. I want to thank you again for all being here tonight. It will take a lot of work to address our infrastructure challenges, but it can be done and it must be done. I look forward to working with the City Council and our entire community to ensure that Hoboken is prepared to address the challenges of the future and is healthier than ever!